Born between September 23 and October 22 is the seventh sign of the zodiac, Libra traits includes masculine, cardinal, positive and it is an Ari sign. Libra is the only inanimate sign of the zodiac; all the others represent either humans or animals. The symbol associated with your sign is the scales of balance which represents the balance that you continually seek in your self and your life. The sign of Libra is symbolized by “balance” and they are often found balancing between two sides in difficult situations. Librans are known to maintain peace and harmony. They are also very level headed and therefore can be sought after for practical solutions. People born under this sign are agile but they also tend to run out of energy easily. Likes: Harmony, sharing with others, gentleness and the outdoors. The most important Libra characteristics are described in the infographic below. Libras are born charmers. Their magnetic appearance is the first trait, which you will notice in them. For this reason, they do not have to exert extra effort to get noticed or recognized. They are very diplomatic. Whatever the situation maybe, they keep a close eye not to hurt anyone’s feelings in the course of their actions. Libras are born romantics. When they are in love, they are the most passionate lovers. They won’t stop at anything to impress the one they love. On the flipside, Libras are very indecisive. They are often struggling between diplomacy and biasness. Although they are endowed with enough potential to make the best for themselves they often tend to lose the opportunity by thinking about the other various options available to them. However, once they make a decision they usually stick to it. They also have a tendency to retreat from a situation than actually facing it. Libra Traits suggest that Librans are two faceted characters; both cheerfulness and darkness are prominent in them. They seem joyful and friendly, always ready for communicate; however, Libras are also brimming with contradictions. They can turn really mean at times. Librans usually have phases of heightened activities as well as phases of complete inactivity and indifference. However, Librans are intelligent and intuitive which can make it a fun being around them. They are great communicators and can engage people in interesting chats. 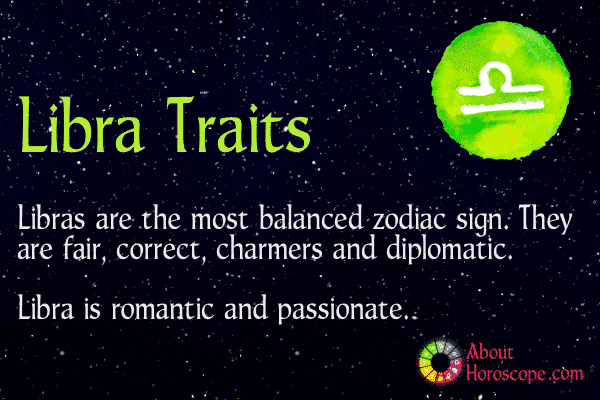 Librans have charming personalities and often make great hosts and hostesses. Librans love to balance so they love to harmonize things in proper order. Known to be peacemakers, they do not love arguments and want to maintain silence and calm in their surroundings. They are also known for their kind-heartedness. With a set of scales as his Zodiac symbol, it is no surprise that the Libra man needs an equal balance of fairness and order in his world. The Libra male is a perfectly balanced specimen of a man. His is the sign of partnership, of equality, and of justice. He will strive to stay on an even keel, always trying to be objective. He will often seek to do what he thinks is best for everyone. He believes that you can please everyone all of the time, if you study every possible angle in any situation. He is a pacifist and dislikes conflict. Nothing can be achieved with a temper tantrum and a Libra man will go to any lengths to avoid confrontation. He much prefers peace and quiet. He strives for harmony and balance. He’d rather talk things through and try to understand your side of the story, than slam doors or throw things. The Libra man will go to great lengths to avoid conflict and achieve calmness in his life. He is objective, fair, and can always see both sides of every argument. The Libra man struggles with an indecisive nature and his fear of making the wrong decision will sometimes stop him from making any decision at all. Libra is ruled by Venus and he is an ambassador of the Goddess of Love. He is stylish and refined. He has a fondness for beautiful things like jewels, sleek cars, and shiny gadgets. He also likes beautiful people, and the Libra man is in his prime at cocktail parties, the ballet, or the theater. He is suave and charming, and will always know just the right thing to say in any circumstance. He has a keen eye for beauty in people, objects, music and words. The Libra man’s intriguing stride and striking physical appearance have eyes turning wherever he goes. Despite his brutish appearance as the “Wolverine” in the highly successful, “X-Men” movie franchise; Australian actor Hugh Jackman, born 12 October 1968, is a typical Libra Man. In addition to his success in big budget Hollywood action movies, Jackman is also a Broadway star. In 2004, he won the Tony Award for Outstanding Actor in a musical for his portrayal of Peter Allen in the musical “The Boy from Oz”. Jackman is also a renowned philanthropist supporting several charities and foundations such as The Global Poverty Project and the MPTV Fund Foundation. The Libran woman embodies fairness, justice, and balance. She is represented by the scales, ideally weighted, flawless and complete. Librans are sociable and have a gift for communication. She is charismatic and captivating, drawing people to her naturally and easily. The very epitome of yin and yang, Libran women are a fascinating mix of rationale logic and erratic emotion, shooting holes in your flawed opinions then making up for winning the argument with her charm. However she is always open to reason and common sense and will good-naturedly admit her mistakes if you can logically talk her onto your side. The tendency to weigh out options and possibilities too long can often cause indecision in Libran women. Your Libra friend may leave you frustrated when she cannot choose between what movies to watch, but take heart; her indecisiveness is on your behalf. She just wants what’s best for everyone. Librans make excellent friends, and will take into account your taste, preferences, needs, and wants as if they were her own. It’s that famous sense of fairness coming into play again. Librans love company, and will surround themselves with friends and family. They are usually found chumming about with Leo and Sagittarius. All in all, they are creative people who love the exotic and beautiful. They make for the best hostesses, who will shower you with attention and manage to successfully engage in the most constructive and analytical discussions you will ever have. They are beauties with brains, who are terrible money managers but fantastic mothers who love and nourish their children, and yet never refrain from scolding their children if they are disobedient or remotely disrespectful towards their father. Perhaps the most stylish Libra woman is American actress Gwyneth Paltrow, born 27 September 1972. In addition to her wide body of work in the movies, Paltrow has made a name for herself in the culinary industry as a writer and as a cook. Paltrow also launched a weekly lifestyle newsletter “Goop” which encourages its readers to “nourish the inner aspect” and take action. Librans can be surprisingly energetic, though it is true that they dislike coarse, dirty work. Although some are modestly content, others are extremely ambitious. With their dislike of extremes they make good diplomats but perhaps poor party politicians, for they are moderate in their opinions and able to see other points of view. They can succeed as administrators, lawyers (they have a strong sense of justice, which cynics might say could handicap them in a legal career), antique dealers, civil servants and bankers, for they are trustworthy in handling other people’s money. Libran financiers sometimes make good speculators, for they have the optimism and ability to recover from financial crashes. A lot of Librans are drawn to the arts and world of entertainment. Some Librans are gifted in fashion designing or in devising new cosmetics; others may find success as artists, composers, cinematographers, critics, writers, interior decorators, welfare workers and they have an ability in the management of all sorts of public entertainment. Some work philanthropically for humanity with great self-disciple and significant results. Librans are ruled by Venus. Therefore, they are absolute romantics at hearts. Romantic relations with Libra can be exciting and full of fun. They also tend to settle for long term relationships and stay loyal to their partners. Librans are not into “love at first sight”. They would take time in disclosing their true feelings. Also, the right kind of ambiance is necessary for the Librans to flourish. They will move cautiously in their romantic relations and don’t get intimate readily. Librans are tender lovers. They attach high value to beauty. Librans are often attracted to pretty faces. Their desire to climb high in the social ladder also makes them careful about choosing their partners. Libran women are sensual when Libran men are charming. Both of them can attract partners very easily. Librans are most compatible with Gemini, Aquarius, Virgo, Libra, Aries and have their most clashes with Taurus, Capricorn, Scorpio, Sagittarius. 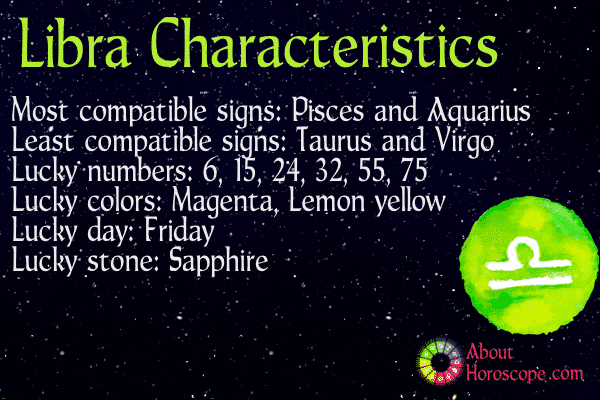 Read about Libra’s compatibility with other horoscope signs. Though most Librans are blessed with good health, some of them could suffer from problems like allergies, asthma, frequent colds and flu. Librans are very active; looking after other people takes up a lot of their lives. They should always take time out and rest when they need it. Some of them could put on a few extra pounds, though getting rid of them should not be a problem as Librans are active people who enjoy sports and dance. Librans generally have clear complexions, fine hair and teeth. They also have beautiful eyes, though some are prone to weak eyesight. They are healthy and have lots of stamina. Most of them are gifted with attractive faces and good complexion. Although they may not look strong when young; they are more robust and get by without any serious problems. As they grow older, they may become minor hypochondriacs, suffering from imaginary ailments. The weaker ones among Librans often suffer from diseases of the stomach, bladder, kidneys and the spine. Numbers that will bring luck are 6, 15, 24, 33, 51 and 60. Favorable colors are Indigo, coffee, magenta and lemon yellow. Their lucky stone is Sapphire, one of the most beautiful and sought after gems in the quartz family. It is considered good luck in many ways and one of the major healing stones. Friday is the lucky day for Librans. So if your spouse or girlfriend cannot decide on which movie to watch or food to order, be patient. It could just be the Libran in her! If you’ve read anything here that made you go “Ummm…” please feel free to share your thoughts at our “Comments” section.